Brothers Cass (Brent) and Jerry Harrington (Payne) come from a military background. Cass is a star aviator, like their father was, and Jerry leaves the submarine service to become a flight cadet to be like his father and brother. The brothers start to share more than the same profession when Jerry falls in love with Cass’s girl, Irene (de Havilland). Macy’s shop girl Nan Spencer (Faye) saves up her money to go on her first cruise to Havana. The only problem is, the ship hits a sandbar in Florida and the ship company has to reimburse everyone and offer them another trip. When ship employee Jay Williams (Payne)-who is also engaged to the boss’s daughter- is sent to reimburse the passengers and have them sign waivers, Nan isn’t satisfied with a check. She saved for years for this trip and also knows what the captain was doing when the ship crashed, which could threaten a lawsuit for the company. Jay’s company sends Nan on an all expenses paid trip to Havana so she will sign the company’s waiver. Jay has to go along-postponing his wedding- to make sure Nan has a good time. Along the way she falls for Monte Blanca (Romero), who is the boyfriend/manager of Rosita Rivas (Miranda). Monte thinks Nan is wealthy and thinks he is using her to pay off his gambling debts. -This is one of many films made in the 1940s with a “good neighbor” feel to it. Several films visited Latin American countries such as Cuba, Argentina or Brazil to showcase these countries and strengthen United States relations with Latin American government. -This was the second of three films Miranda and Faye made together. The other two films were “That Night in Rio” (1941) and “The Gang is All Here” (1943). -Alice Faye and Cesar Romero dancing to “Romance and Rhumba.” It gives the audience an opportunity to see Romero’s smooth dance moves. Alice Faye once said her singing voice was deeper than the plots of the films she made. This may be the case with “Week-End in Havana,” but this film is a lot of fun. 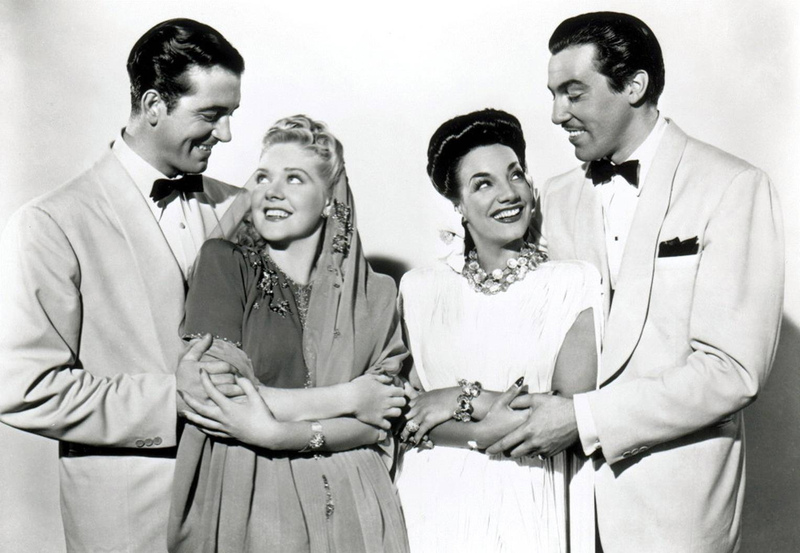 The colorful costumes and scenery are gorgeous in Technicolor, Carmen Miranda and Alice Faye are equipped with catchy songs and the two leading men are nice to look at. The four leads seem to have fairly equal screen time- each delivering witty lines and offering scenes filled with charm. 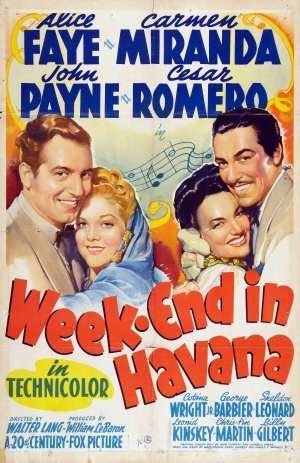 “Week-End in Havana” is a lighthearted 1940s “good neighbor” film, that is full of color and fun.